Poor old Martin Jol. A defeat to Arsenal sees his job (allegedly) dangling by a spindly thread. A poor start to the season and a battered Spurs cheque book has seen the big Dutchman coming under severe scrutiny from certain quarters. Even though there is no better option for Tottenham at the moment and Jol clearly doesn’t deserve the boot, it looks like his days could be numbered… and I love it. Now, before you think I’m some gloating Gooner, think again. I’m a Bolton fan. If Spurs fans are worrying about their season, try a mile in my shoes. Tottenham have a manager who is able to dig them out of a rut. My beloved Trotters seemingly have a manager in Sammy Lee who couldn’t fight his way out of a paper bag (I’d love to be proven wrong). So, if Jol is looking like he’s dole bound… cough cough… are you listening Phil Gartside? Reliable Sources tell me he’s going to be the next Holland Manager, as Marco Van Basten is the Bizarro McClaren: Enough balls to drop big name underperformers, but a complete lack of tactical nous. 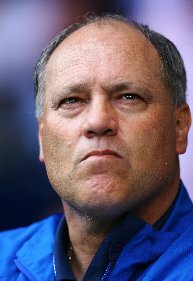 My mole tells me Jol will hand in his resignation before Christmas, pending Holland and Spurs results over the next three months. How is it that Jol doesn’t deserve the boot? Seems like he’s had plenty of time and more than plenty of money to to turn this team into something.